Michael Thompson's first round par 72 at the Shell Houston Open was anything but boring. Michael got off to a fast start with three birdies in his first six holes including back to back birdies on holes #12 and #13. In the span of the next eight holes, Michael would go from near the top of the leaderboard to near the bottom. He made consecutive bogeys on holes #17 and #18 and things got really ugly with consecutive double bogeys on holes #4 and #5. If you know Michael, you know that giving up at that point was not an option. He rallied with three birdies over his final four holes and had managed to climb back to even par 72. He is currently tied for 64th and he'll be looking to carry the momentum of his final holes into tomorrow's second round. As you would expect with a round that had six birdies, two bogeys, and two double bogeys, Michael's stats were a mixed bag except for his putting stats which were off the charts. His Strokes Gained Putting was +3.541 which ranked third for the round and his putting average was a mere 1.455. Michael will once again be playing with Russell Henley and John Merrick. They will be teeing off from the first hole at 1:00pm ET. The group should be featured in the television coverage on Golf Channel tomorrow from 4:00 - 7:00pm ET. 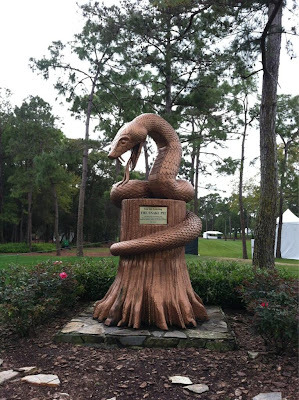 If you watch the coverage of the Shell Houston Open this week you may notice a remarkable similarity to Augusta National, host course of the Masters, and that's not by accident. The SHO has embraced its role as the premiere tune-up to the Masters. They have configured the Redstone Golf Club's Tournament Course to closely mirror many aspects of Augusta including the course's length; the size, slope, shape, and speed of the greens; the shaved banks; and even the way the fairways are mowed. Michael Thompson will be continuing his Masters preparation as he joins a strong field at the SHO. Michael played Augusta last week as part of that preparation but this week he'll get in some good old fashioned competition under Master style conditions. Look for the greens to be running at a blazing 13+ on the stimpmeter. Michael will once again be in one of the featured groups of the tournament. He will be playing with fellow 2013 first time PGA Tour winners Russell Henley and John Merrick. The group will tee off from the tenth hole at 8:00am ET. As Michael Thompson takes a well deserved week off to re-charge his batteries after a busy three week stretch out on tour, here's a look back at an interview Michael did last year after his second place finish at the US Open. If you watched some of the interviews Michael did after his victory at the Honda Classic you'll recall he referenced some of his previous experiences while he was in contention and some lessons he learned. This interview from 9 months ago foreshadows some of the success that would be coming his way. It's worth a second look! "Well................. I still like the golf course! And now I'm eating Chipotle! What an awesome day!" Finishing the round at 6 over par, he'll have some work to do tomorrow in order to charm Copperhead. Thompson tees off at 8:30 ET and will be grouped again with Scott Brown and Matt Kuchar. Michael Thompson watches his third shot at the par 5 tenth hole. The ball would find the bottom of the cup for eagle and propel Michael into a tie for 5th at the WGC Cadillac Championship. All Michael Thompson has done after winning the Honda Classic is to shoot three rounds in the 60's and move up the leaderboard into a tie for 5th. Michael made the most of "moving day" by posting one of the low rounds of the day at five under par (67) which has him at -11 for the tournament and tied for 5th. Most of the talking heads said that Michael's win at Honda was "out of the blue" put the same can't be said of his top notch performance at the WGC Cadillac Championship. Everybody wants to see the marquis players, the guys who are exciting or wear the bright clothes and all that. I've always kind of treated my golf game or kind of lived by the motto as, I'm going to let my clubs do the talking. If my clubs talk, and they are saying a lot of good stuff, then good things are going to happen to me. Right now, his clubs are, in fact, 'saying a lot of good stuff'. During Saturday's third round Michael posted four birdies and an eagle (see the video below) and limited his mistakes with only a single bogey on the card. Michael had two hole outs during the round. In addition to the bunker shot on hole #10, he had a chip in from just off the green on hole #17 which got him to -5 on the day. Michael will once again be paired with Sergio Garcia. They tee off at 2:20pm ET. Undaunted by the elite golfers surrounding him on the leaderboard, Michael Thompson posted another three under par 69 at the WGC Cadillac Championship and is now tied for 10th after two rounds. He is 7 shots back from Tiger Woods who leads the field. Michael climbed the leaderboard Friday by hitting fairways (11 out of 14 which was tied for 4th) and greens in regulation (14 out of 18 which was tied for 9th). He is currently tied for 3rd in driving accuracy for the tournament hitting 20 out of 28 fairways. He'll be looking to keep his current rush of momentum going in the third round on Saturday. Michael will be paired with Sergio Garcia and tees off at 12:45pm ET. Michael Thompson putts for birdie on hole #9 at the Blue Monster at Doral. Nobody would have been surprised if Michael Thompson's first round at the WGC Cadillac Championship wasn't spectacular. After all, he's had press interviews all week with radio stations, televisions shows, and newspaper reporters after his victory at the Honda Classic. All of that to say, it hasn't been a normal week of preparation. In fact, as of his PGA Tour press conference on Wednesday at noon, Michael had only been able to practice the first nine holes of the Blue Monster at Doral once! He was hoping to get to practice the back nine on Wednesday afternoon. Lack of practice or not, Michael had a great first round at Doral shooting a three under par 69 which has him tied for 16th. He had four birdies on the day and only one bogey. He continued his top form from last week by hitting 9 out 14 fairways and 12 out of 18 greens in regulation. He also was +1.835 in strokes gained putting. The three under par round leaves him just three shots from the top of the leaderboard. Michael will once again be paired with Chris Wood and Stephen Gallacher. They tee off from the first hole at 12:04pm ET. Just four days after his first PGA Tour victory, and as a direct result of his increased Official World Golf Ranking, Michael Thompson will look to carry his momentum into the Cadillac Championship. This will be the first time he will compete in a World Golf Championship (WGC) event. The Cadillac Championship is the second of four WGC events held throughout the year. These events were created to combine players from the various tours around the world and are generally limited to the top 50-70 players in the world. Michael qualified when his OWGR jumped to #45 and inside the top 50. The WGC events are "no-cut" events so the entire field will play all four rounds. The Cadillac Championship is played at the TPC Blue Monster at Trump Doral which boasts one of the most feared 18th holes in golf - especially if the wind is blowing into the players' faces. The long par four boasts water on the left, bunkers on the right, and a very narrow landing zone off the tee. The second shot is just as daunting as water is still on the play on the left and the long-narrow green is guarded by bunkers. Michael will be paired with Chris Wood and Stephen Gallacher for the first two rounds. The group will tee off their first round from the 10th hole at 12:59pm ET. Michael Thompson battled tough conditions and an incredibly strong field to become the 2013 Honda Classic Champion! He had the second best round of the day, finishing at -1, -9 overall and won by two shots over Geoff Ogilvy. "This is everything. This is a childhood dream come true. I've dreamed of playing out here since I was 7 years old and to win, it's just unbelievable. I just can't put it into words. The whole day was awesome." Michael managed to improve his position at the end of each round this week. After round 1 he was tied for 16th. After round 2 he was in second. After round three he was in a tie for first and at the end of the tournament he sat alone at the top of the leaderboard. As the wind picked up over the weekend, scores rose as the conditions became very difficult. In fact, during Sunday's final round the scoring average was nearly 4 shots over par at 73.707 . A huge climb up the FedEx Cup Points and money lists to no. 11. Monday Backspin - Amanda Balionis recaps Michael Thompson's victory and all the news from The Honda Classic. Thompson applies major lessons in breakthrough victory at PGA National - A nice opinion piece from Greg Cote of the Miami Herald plus a good picture of Micahel with Mattie Lou! #getreadycouch 2.0 ends in a feel good story! Lost and Found - Great article from Tim Rosaforte of Golf Digest with quotes from Susie Meyers and mentions about his family. Former Tulane golf coach Tom Shaw savors Michael Thompson's Tour victory - Another great article with a Tulane spin. I Guess We Need a New Goal - Michael's wife Rachel blogs about what it was like to come to grips with the struggles leading up to the Honda Classic and what Michael's mindset was to be able move past it and become a champion. Look Who's Climbing the Leaderboard by Playing "Michael Thompson Golf"
Michael Thompson looks over a birdie putt during the second round of the Honda Classic. It took a few weeks to knock the rust off, but Michael Thompson's golf game is looking as good as ever. Michael spent the last couple of weeks working with golf coach Susie Meyers and based on the first two rounds at the Honda Classic the practice is paying dividends. Michael followed his three under par 67 from the first round with an even better five under par 65. His 36 hole score of eight under par has him in second place going into the weekend one shot off the lead of Luke Guthrie. The recipe is working for Michael at the difficult PGA National course. He's hit 28 out of 36 greens in regulation (T2) and 21 out of 28 fairways (T13). He's also 16th in the strokes gained putting stat for the tournament. Michael watches his bunker shot on the 18th hole during the second round of the Honda Classic. Michael will be paired with current leader Luke Guthrie in the final group of the day. They tee off at 1:40pm ET.